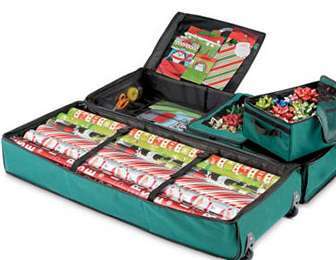 Get wrapped up in Christmas spirit this holiday season with this gift wrap storage bag that makes wrapping all of your Christmas presents a cinch. With double the storage of the original gift wrap storage bag you’ll be able to wrap twice the Christmas gifts this holiday season. Forget rummaging through mountains of boxes to find wrinkled wrapping paper and crushed bows this Christmas. Keep wrapping paper, bows, scissors and accessories neatly tucked away in one convenient container and save leftover items for the next special occasion when you purchase the Ultimate Gift Wrap Storage Bag. Each storage bag is constructed of high quality, durable polyester with water resistant PVC backing and a heavy duty zipper closure to keep wrapping supplies safe and dry all year long. Featuring wheels to make transporting the bag simpler, straps to hold even double rolls of wrapping paper in place, and two removable mesh top bins for storing all your wrapping necessities, this storage container is a must have this holiday season.